Jonathan Rees is the Managing Director of Western Union Business Solutions in North America. Western Union Business Solutions is an International Trade Administration Strategic Partner. A healthy U.S. economy includes strong exports. In an age of ever-increasing global trade, these exports indicate the demand for U.S. products and services, particularly in countries with an expanding middle class.Since 2010, the government has committed to help U.S. businesses find buyers worldwide, win more contracts, and learn new ways to sell products and services overseas. This commitment highlights the importance of small and medium-sized enterprises (SMEs) in propelling the American economy. However, after a sharp appreciation, over the last two years U.S. exports have been showing signs of hitting a plateau. 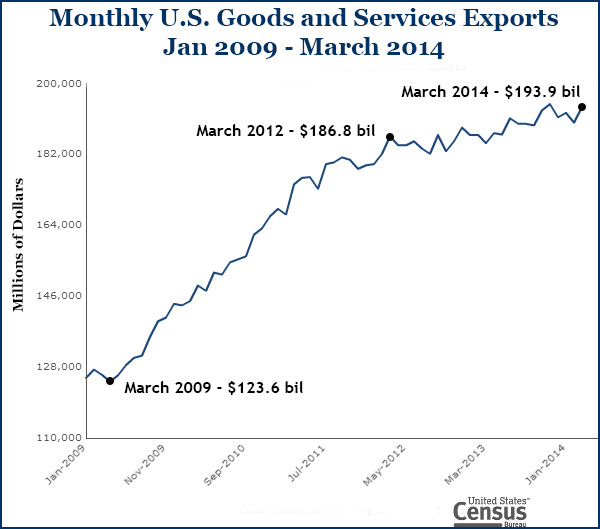 The good news is this: U.S. exports have abundant room to grow. In fact, compared to other industrialized countries, there are signs that the United States is only beginning to tap into its export potential. According to the World Bank, exports accounted for only 14 percent of the U.S. GDP in 2012, while other Western industrialized nations, such as Germany, the United Kingdom and France, export between 30 to 52 percent of their GDPs. According to the U.S. Small Business Administration, SMEs in the United States generate more than 46 percent of the country’s nonfarm private gross domestic product. They also comprise 98 percent of America’s exporters and produce 33 percent of all export value – clear drivers of economic growth. So what can American SMEs do to expand this export potential? Simply put, make it easy for the buyer. Successful exporters try to make their goods and services as attractive as possible, regardless of the buyer’s location. American exporters can take some easy steps to do this and protect profits at the same time. By using the right combination of payment and cash management strategies, SMEs can improve their cash flow and increase overseas demand. Plan ahead and create a cross-border payment strategy that supports your company’s cash flow while hedging foreign exchange risk. Most foreign buyers generally prefer to trade in their local currencies to avoid foreign exchange (FX) exposure. As such, selling in foreign currencies can be a viable option for SMEs who wish to enter and remain competitive in global markets. It’s important for SMEs to take a critical look at their business needs and build a cross-border payment strategy that can hedge FX risk. Find a partner that can help you determine what your cross-border payment needs are and set your actions accordingly. One of the possible solutions to hedge FX risk is a forward contract, which enables the exporter to sell at a set amount of foreign currency at a pre-agreed exchange rate with a delivery date from three days to one year into the future. Forward contracts can be ideal for protecting against FX fluctuations and are useful for budgeting. Use a budgeting tool that gives visibility to FX exposures and simplify foreign accounts payable. If you are doing business in multiple countries and receiving payment in multiple currencies and from different time zones, it’s helpful to use a payment solution product that will help you keep track of your invoices. Some providers also offer budgeting products that automatically calculate total currency exposure for multiple invoices. This allows businesses to use a single platform to track cross-border incoming and outgoing cash flows so that businesses can make more informed decisions. Such international budgeting and cash management products are offered by many reputable global financial services firms, including Western Union Business Solutions. Settle invoices with overseas vendors in their local currency. Setting prices in vendors’ local currency as a practice hasn’t been widely adopted in the United States., but it’s worth considering. If your company does a high volume of trade in a certain country or currency, it makes sense to bill your customers in that currency. Overseas vendors often charge extra fees for paying companies in U.S. dollars in order to mitigate against currency risk. For example, research from Western Union Business Solutions shows that one in five Chinese suppliers adds roughly 3-4 per-cent to U.S. dollar invoices to cover FX fluctuations. Making deals with overseas vendors using their local currency also gives business owners the opportunity to negotiate a discount. This last step represents a simple change in foreign exchange strategy that can send a signal that you, the exporter, understand your overseas customers and want to make it easy for them to do business with you. It is just a matter of thinking about what the customer wants and acting on it – a good strategy for any business. To learn more about how to manage FX risk and how to export in foreign currencies, you may wish to read the U.S. Commerce Department’s Trade Finance Guide: A Quick Reference for U.S. Exporters.